Progress is never in a straight line, especially if you’re surrounded by fog. My journey through the orthodontic wilderness is an example. The forest of the orthodontic specialty is populated with the tall trees of orthodoxy. “Malocclusion is the problem”, “Never expand the lower canines”, “All cases must finish in Angle Class 1”, “Extraction of teeth has no ill effects”, and so on. But when I became educated on the issue of sleep and the disorders of breathing during sleep, some of these concepts no longer made as much sense to me as they once had. Instead of malocclusion being the problem (and braces the solution), it now appears that malocclusion is a symptom – a process of the teeth compensating for another problem in the jaws, face, or head. For instance, when a baby is having trouble breathing, say, due to nasal congestion, she will position her head in such a way to open the oral airway in order to compensate. After all, taking the next breath is the most important thing we do moment to moment. But that changes the functional matrix of the mouth, what with the tongue no longer supporting the growing palate and the lips and cheeks now active in swallowing. Over time, the maxilla distorts in shape and when the innocent teeth erupt they have no good place to fit and just accommodate to the smaller space. To make matters worse, she is now breathing unfiltered air and expelling too much carbon dioxide from overbreathing and her biochemistry is now out of whack, too. And I’m supposed to fix all this with braces? That just doesn’t make sense. For a while, I was quite disoriented as I kept (and keep) bumping into these trees of orthodoxy. I had to examine each orthodoxy and ask, “Is what I once learned still true?”, and “If it is true, is it still useful?” I will always have my ethical standards to maintain, but if I’m going to be truthful with my patients, I can no longer just say, “You need braces because you got your crooked teeth from your parents” and that’s it. I have to help my patients understand that they have issues with their health that have led them to this place and that they should at least consider taking care of themselves better. Plus, I now feel the obligation to help them do that within the scope of my practice. For instance, if a child is sitting in my chair with her mouth hanging open, I know she is not breathing properly and probably not sleeping well, either. Many kids are in a fog of their own, with attention deficit and neurocognitive issues from a lack of deep sleep. Should I just ignore that and just straighten their teeth? What kind of healthcare provider would I be if I did that? I have to help them learn to clean and clear their nose and close their lips at the very least. Better yet, I can teach them to place their tongue on the palate and learn to swallow without using their lips and chin and cheeks so their teeth are not jammed together by the muscles. After all, I am a doctor, aren’t I? Some of the fog of my orthodontic education is lifting as I have found practical methods for helping children and adults become healthier as well as having a pretty smile. But the fog remains for much of the dental profession. Many professionals continue to feel comfortable in the woods with the big trees to hide behind. Those who are making a good living from practicing in the old way, or who are running institutions whose reputation is based on the older orthodoxies, are very reluctant to let go of what is comfortable and safe. I don’t blame them. I was like that, too, for a long time. I remember hearing specific voices (Robert Ricketts, Leon Kusic, Duane Grummons, and John Mew, to mention just a few) challenging me to recognize this information but refused to heed the call for first 27 years of my 34-year career. Now the fog is lifting for others, too. The American Dental Association – not often known for progressive positions – has nevertheless come out with a position paper on the role of dentistry in treating sleep and breathing problems. Their statement that dentists have the obligation to help children “develop an optimal physiologic airway and breathing pattern” is perhaps the most forward-thinking policy I could imagine and sets the stage for our profession to advance dramatically in the mission for children’s health. This is a most exciting time to be in dentistry. I see the sun shining on a bright, fogless future. In recent years there has been much debate about sleep-related breathing disorders (SRBD) and whether or not dentists and, in particular, orthodontists, should get involved. Critics have pointed out that there is little scientific evidence to support such involvement, added to which, most dentists will simply see it as an opportunity to make money! The critics are wrong in both their presumptions, especially about the evidence. Given the fact that this is a relatively recent development in dentistry, the available evidence has impressed the American Dental Association to the degree that in March 2017 the ADA issued a “Proposed Policy Statement on the Role of Dentistry in the Treatment of Sleep Related Breathing Disorders” (see the ADA website for the full text), ratified in Congress in October 2017. This document makes it clear that, while the diagnosis and management of sleep disorders are fundamentally medical issues, for many sleep disorder patients, especially children, dentists and orthodontists have within their skill set possibly the most effective treatment solution in the form of appropriate oral appliances. The ADA is also clear that while CPAP is usually the treatment of choice for Obstructive Sleep Apnoea, there is a high level of non- compliance, especially among younger patients. This explains why oral appliances are deemed more effective overall. The ADA Policy Document states that “dentists can and do play an essential role in the disciplinary care of patients with certain sleep related breathing disorders and are well positioned to identify patients at risk of SRBD”. The document goes on to state that “SRBD can be caused by a number of multifactorial medical issues and are therefore best treated through a collaborative model”, and “the dentist’s recognition of sub-optimal early craniofacial growth and development or other risk factors may lead to medical referral or orthodontic/orthopaedic intervention”. The dentist’s role in the treatment of SRBD, with special emphasis on sleep apnoea, is summarised by the ADA as follows: 1.Patient screening and appropriate referral to physicians. 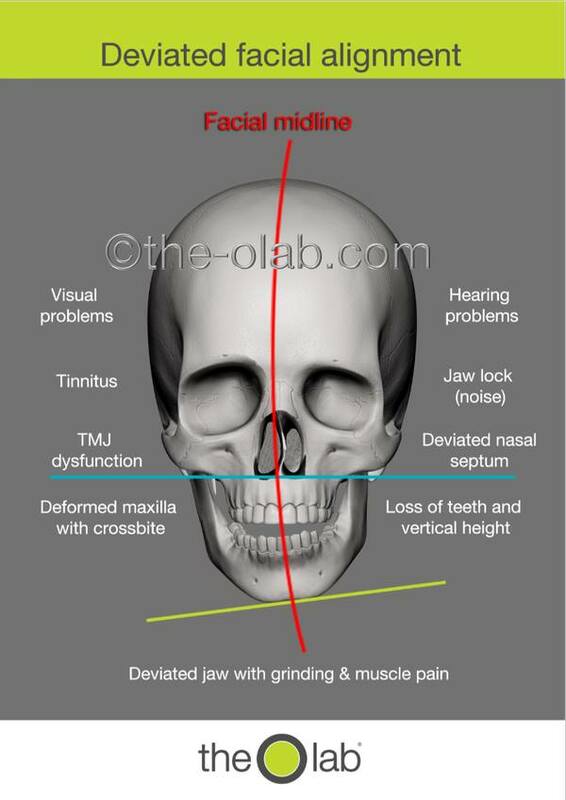 2.To identify signs and symptoms of poor craniofacial growth and development. 3.Provision of appliance therapy, if deemed appropriate by the dentist, to be monitored and adjusted as required by the dentist. 4. Referral for surgery if appliance therapy is deemed inadequate. 5.To continue to update their knowledge of dental sleep medicine. 6. To maintain regular communication with the referring physician and to arrange follow-up sleep testing to evaluate improvement. The dentists among us will all be aware of the signs of potential sleep problems for children such as dysfunctional swallowing, mouth breathing, tongue-tie, inadequate maxillary development, tendency for vertical facial growth and head-forward posture – all matters that would become far more apparent to a dentist on the basis of a twice- yearly check up than they would to a physician. So why are these kinds of sleep disorders viewed as fundamentally medical issues, when it is the dentist who can screen, diagnose,treat, monitor and refer for sleep investigations when required? Of even more concern for us in the UK is there is effectively no mention of sleep related breathing disorders on the websites of either the British Dental Association or General Dental Council? Where does that leave us? The advice on Kevin O’Brien’s blog is that as he considers there is no acceptable science to support the dental sleep medicine view, then we cannot claim to treat these disorders; all we need to do, we are told, is refer for removal of the officially-regarded most common cause of obstruction, tonsils and adenoids! If we do embark on an orthodontic approach, all we can say is, according to the O’Brien view, “let’s see if straightening your teeth improves your nocturnal breathing” as if straight teeth was the only issue. They are not, of course; to quote Barry Raphael, “the teeth are simply an expression of the same deficiency – small jaws and an impaired airway”. They do, however, make excellent handles for us to take hold of to solve the airway problems. If straighter teeth are the result, then we have all made a gain. The crucial point is that breathing disorders can have serious health implications; not so crooked teeth. The OLab have produced this informative diagram. The journal for the British Society for the Study of Cranio-Mandibular Disorders. Please email if you would like a digital copy. at an early age in order to maintain normal facial growth. My third presentation to final year dental students by kind invitation of the Interim Executive Dean and Director of the Sleep Disorders Clinic at Guy’s Campus, Professor Mark Woolford, ” Exploring the Wider Role of Dentistry – The Effect of Jaw Problems on the Rest of the Body.” Two sections: Airway & Sleep Disorders, Temporo-Mandibular Joint Dysfunction and Posture. (ii) Movement Disorders. The advantage of early correction using appliances such as the Biobloc, ALF ( Advanced Lightwire Functional), BWS (Bent Wire System) and Myobraces was also covered.